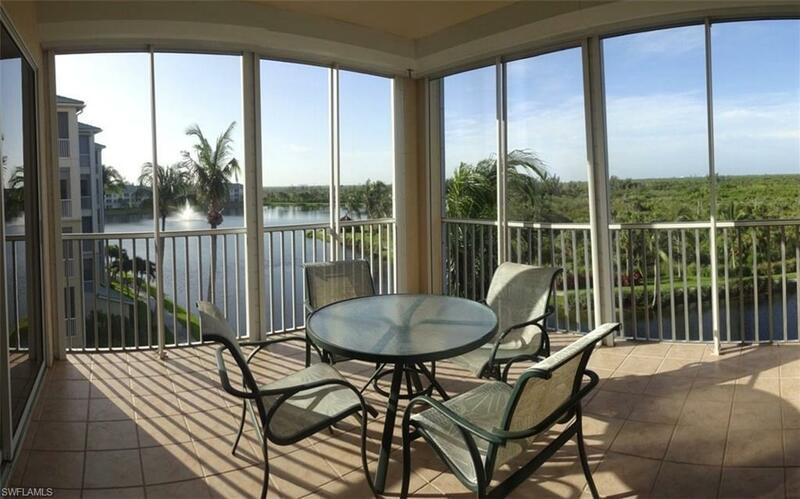 Immaculate 2 bed/2 bath plus large den 3rd floor "St.Thomas" luxury condo located in Sutton Walk overlooking the nature preserve, lake & Ft. Myers Beach skyline! This lovely home is a light & bright end unit with 2056 living area & has 2260 total area including lanai! Home features an oversized underneath garage, has electric shutters on lanai & all windows, crown molding, screened entry & a 2015 4 ton 16 seer A/C! Master bedroom has a closet system, along with a jacuzzi tub & a raised vanity in the master bath! Kitchen features a built in desk, island, & countertops all with granite & granite backsplash plus selling partially furnished! Sutton Walk has a first floor lobby area and a private pool! "Pay" as you "Play" Golf!